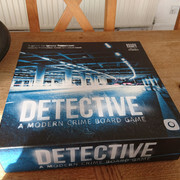 Detective: A Modern Crime Board Game! 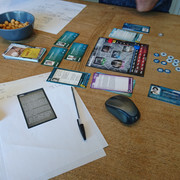 This is a Coorperative game, where the player(s) take the role of a Detective that will need to look in to several cases. There are 5 cases that come with the game, and Portal has announced a 6th case soon to be released as a mini-expansion. (This 6th case was previously only available at conventions. Many reviewers could use this to review the game without giving away spoilers for the main game). All 5 cases are stand-alone, but ther is an overall narative that connects all cases! This narative is not immediatly clear, but will be revealed throughout the 5 cases. 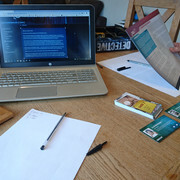 The setup of the game requires the contents of the box, and a laptop/tablet/smart device to connect to the online database to lookup additional information, like personal files, questionnaires, evidence and to file and match fingerprints and other evidence. This is required! You can't play without it. Pen and paper can be used to make notes, and this is also recommended! For every case you get a certain amount of days to investigate, and every action you take can cost you time throughout the day. Moving locations, interrogating, researching can all cost time. You can work overtime, but this will cause you stress that can cost you in the long run! We spend about 2,5 hours on the first case, writing down about 4 sheets of notes, and tried to make a mind map that shows how everything is connected. There is a lot of opportunities to look further in to things, and you are encouraged to researched some historical facts and figures! After the final report, you can either reset the case to play it again with others, or see the story epilogue and findings. Nice Report Willem. This game has had a lot of love. I saw it in NY when i was there. I kinda have a mixed feel for this because of the weird computer-game board-game cross over. These guys seem to be doing it really well. I wonder how plat testing etc is managed and how repeatable it is etc. Sounds like you're having an awesome time with it. Thanks for sharing the details. It's great it's made you research other bits and bobs too. Have you played Consulting Detective - I'd be interested to know how they compare. This seems like a great update on the format. I actually did like the tech-combination cross over. 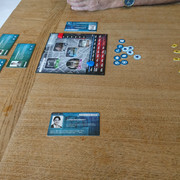 The board is still the main point in the game, and you go through the case cards that give most information. The online database can give personal profiles, and can match fingerprints (samples) etc. It does not seem very repeatable if you want to play it with the same people. If you play it with others, you can choose to not give out all the information you know. As you can also make different choices, you can end up very differently. What was your first board game?? ?